We can all agree that operating on the roof above a heavily involved structure can be dangerous if we are not paying attention to fire conditions, but the fire may not be the only hazard we are faced with. We must notice any change in the feel of the decking any time we are operating on the roof, even if for a routine alarm. Many structures are using clear corrugated panels as skylights that may be hard to spot especially in adverse conditions. These panels will not support a firefighter’s weight and pose a great hazard anytime we are operating on the roof. These types of skylights can generally be found on single story commercial buildings such as warehouses, storage facilities, shops and garages. They are constructed of 3’ x 8’ translucent corrugated polycarbonate sheets that are installed flush with the remaining corrugated metal decking, which can make them difficult to spot when looking across the roof. Sometimes these panels are even painted to blend in with the existing roof, which again makes them even harder to notice. They may also degrade and discolor from repeated UV exposure causing them to form a grey color that generally matches the color of the remaining roof. These panels will not support the weight of an averaged sized fully equipped firefighter. OSHA standards require any screens placed over them to be able to support a minimum of 200 lbs. However, this does not mean that business owners will take on the added expense of installing these screens to protect them from something they themselves will likely never come in contact with. Many of the panels you will come across will have nothing more than a small warning sticker on them that does no good in high stress smoky conditions at night. On June 28, 2015 a Denver firefighter fell through a polycarbonate skylight while searching for fire extension after a dumpster fire damaged the single story commercial structure. He was seriously injured when he fell approximately 17’ onto the concrete floor. He was taken to the hospital and later died from his injuries on July 15, 2015. Please don’t let his sacrifice be in vain, learn from this tragic incident and keep it from happening to anyone ever again. Get out and learn your territory so that when the bell rings you can aggressively make these roofs in order to ventilate for victims and crews inside. 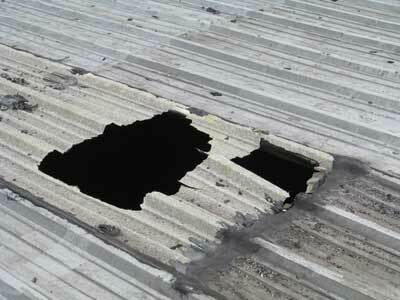 The time to find out a building has these skylights is not when someone’s life depends on it! Remember that when the bell hits it’s about THEM!